Minerals By Sandrah ♥ Natural Makeup & Skin Care. Process time is 5 to 7 business days not including weekend or holidays. If you need something by a specific date please send a direct message or email. $3.99 First Class USPS or $7.99 Priority Mail to USA. Cruelty Free Mineral Makeup and Natural Skin Care. - Follow LittleStuff4u On Instagram or Facebook for sale specials. - Join our official website newsletter for updates on sales. - Have Questions? Need help with your order? Just Ask! If you are purchasing items for a gift and need help, please ask! How did I get started with mineral makeup??? Well.. To make a long story short.. It all began one very early morning back in 1997. I saw an infomercial on tv about Mineral Makeup. It was the first time I ever heard of "Mineral Makeup" It really caught my attention and 2 cups of coffee later, I ended up ordering the whole kit. A week later I had my first order of mineral makeup and some brushes that came with the kit. I started using it and really liked it except it seemed to make my face feel itchy. I loved the look and the concept but could not get past that itchy feeling. Sigh... Okay so back to my usual liquid makeup.. As some time went on I still wanted more info on the mineral makeup concept so I searched online and eventually found another website that sold something similar. It had very few ingredients and claimed to be healthy. I ordered that one and it was much better for my skin. All was good.. I was finally happy with my new makeup.. However, I was still curious to learn more about mineral makeup so I began to do even more research on how it was made and learned more about the ingredients. I bought several Do It Yourself mineral makeup kits, supplies and instructional books. 2 years later I turned a spare room into a makeup lab. I began mixing and blending and did more research on ingredients and what did what to make it even better. My friends called me "The Mad Scientist"
Another year later after plenty more research, reading and learning, trial and error, testing on myself, family and friends.. People tested, never animal tested. LittleStuff4u Minerals was born. Fast foward 20+ years later and we have grown and expanded into a 700 sq foot space with plenty of room to create new idea's. 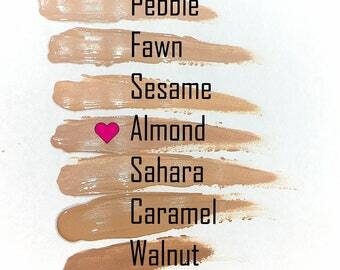 ♥ Mineral Makeup for all skin types with pure natural ingredients... No Bismuth.. No Fillers.. No Talc.. So you get No Itchy Skin! Returns: If your product is damaged or broken upon arrival please contact me asap. You will need to send photo's of the damage and also return for exchange within 7 days. If you have other concerns or questions please contact me anytime. Due to health policies on cosmetics I can not accept returns or refunds on used cosmetics or skin care products. Please try samples first to determine if the products will work for you. If your product is wrong for you, please pass along to a friend who may enjoy it. If You Are New To The Product - Please Try Some Samples First! I offer many items in sample or trial size to assist you in getting the correct shade. Please try a sample size or 2 before buying full size products. Do not judge shades based on names of shades or images alone. I sell tester bags and sample sizes for the purpose of testing colors. You may need to try 2-4 different shades before finding the correct one. 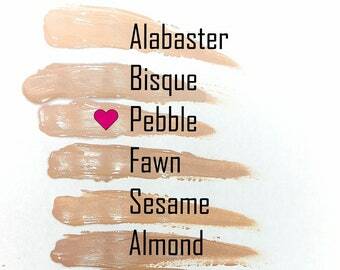 Not sure what shade to buy? I can do custom orders based on your skin tones and prior shades/brands used in past. Please contact me any time for a free shade consultation! I accept PayPal or Credit Cards directly thru Etsy. Payment must clear prior to orders being processed & shipped. Shipping is always combined into one flat rate price. All orders ship USPS with tacking info. Flat shipping rate of $3.99 First Class USA Mail. First Class Mail Includes Tracking Number. Flat shipping rate of $7.99 Priority USA Mail. Priority Mail Includes Insurance and Tracking Number. Priority Mail does NOT speed up MY processing time. Most orders ship within 5-7 days of payment. Orders process & ship as they are received. Process time is based on # of orders before yours. Process time can take longer during busy times. If you need your order by a specific date please let me know. Please be sure SHIPPING address is accurate. I am NOT responsible for packages lost by the postal service. I currently ship to the USA and Canada ONLY. Customs fees, and/or Import Taxes due to your home country. I am not responsible for any additional fee's charged at customs. I'm not responsible for any shipping delays due to customs. Contact me anytime with any other shipping questions. If you have any other questions please contact me at anytime! To fulfill your order, you must provide me with certain information (which you authorized Etsy to provide to me), such as your name, email address, postal address, payment information, and the details of the product that you’re ordering. You may also choose to provide me with additional information (for custom orders, for example), if you contact me directly. Yes! I always combine shipping! Shipping is flat rate no matter how many you buy. Buy 1 or buy 20 you only pay shipping for the 1st item. *NOTE* For combined shipping you must add each item to your shopping cart first by using the Add To Cart option and then complete checkout. If you select the Buy It Now option you will be charged shipping on each item. If you think your order will weigh over 14 oz please choose Priority. Shipping is with USPS and includes tracking number. It's best to try 2-3 samples to see what might work best. If you need help selecting colors please send me a message. Please do not judge shades based on names of colors or photo's only. If you buy a shade and it does not work for your tones please contact me to discuss what the next best shade options to try may be. I offer sample size in several items so you can test out the colors or products that will work best for your skin type or tones. Samples are suggested to try before buying larger full sizes. Samples can be selected from the drop down menu on each listing. Samples are not available for pressed or baked makeup products. Check my shop home page for monthly promo codes. Join our website newsletter for emails about discount sales. All Orders are filled on a first come basis as they come in. Process time depends how many orders are in line before yours. Most orders process and ship within 7 business days. During busy times orders can take up to 8 days to ship out. Once shipped, first class takes about 3-5 days to arrive. Priority mail typically takes 2-3 days to reach you. Priority mail does NOT mean it will be processed faster. If you need something by a specific date, please contact me prior to placing your order. Other questions? Just ask!